A baby or animal may be small at term for a variety of reasons, which are not all nutritional. Table I illustrates this. 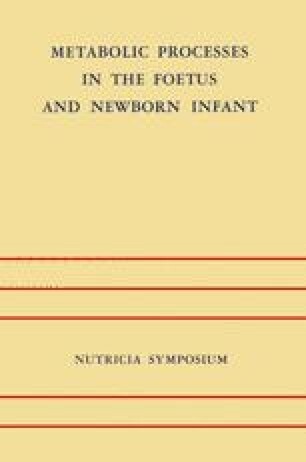 The weight of girl babies averages less than that of boy babies, and the work of Lubchenco,Hansman, Dressler and Boyd (I) showed that the mean weight of the male foetus was already greater than that of the female by the 24th week of gestation and that the average boy was heavier than the average girl from then onwards till term. This is true of other species too, the guinea pig for example, and it has been suggested that it may be due to greater antigenic dissimilarity when the foetus is a male (2). Whether this is the explanation or not, there seems no reason to suppose that females are more likely than males to be undernourished in utero.